Canadian newcomers weave their way through indie-rock conventions to produce overdone, mediocre material. 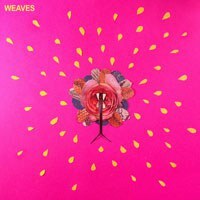 Produced by David Newfeld of Broken Social Scene fame, the Weaves' self-titled debut EP serves as a reasonable introduction to the Toronto-based four-piece. But reasonable is hardly synonymous with exemplary as the band fumbles its way through a decade and a half of indie tropes and formulas. Overly layered instrumentation paves the way for complication, with nonsensical "ooo-ooo-ooos" and "la-la-las" spliced between garage-driven reverb Weaves is allegedly trying to avoid. While the sonic experiments are lacking, lead vocalist Jasmyn Burke presents herself as the outfit's saving grace. Her sultry vocals improve the elaborate backdrop, allowing for some simplicity among the chaos. But while some tracks (“Take a Dip,” “Do You See Past”) pulse with promise, it's evident Weaves is tackling growing pains that desperately need to be overcome prior to a full-length release.